The Harlingen community came together last night at Victor Park for a candlelight vigil to honor the victims of recent disasters. The event was hosted by Pastors Donald Hamm and Antonio Caldwell. HARLINGEN — One by one, more than 50 people gathered at the Victor Park pavilion last night and lit a candle to honor those affected by recent natural disasters and the shooting in Las Vegas. “In trying times, we respond best when we respond in faith,” Pastor Bill Reagan, executive director of Loaves and Fishes of the Rio Grande Valley, said shortly before the candlelight vigil began at 7 p.m.
Local residents, pastors and government officials came together in the park, including Harlingen Mayor Chris Boswell and Cameron County Judge Eddie Treviño, Jr. 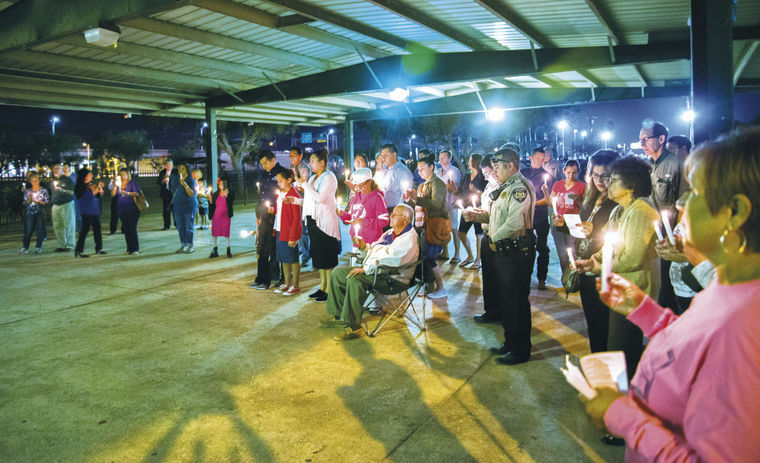 The vigil was the idea of two longtime friends, Pastor Donald Hamm of Kingdom Connection Worship Center in Brownsville and Harlingen’s Antonio Caldwell, an operations manager for IDEA Public Schools. “My heart is really heavy over all the natural disasters, the hurricanes, the wildfires, the earthquake in Mexico, and the shooting in Las Vegas,” Hamm said. Caldwell said he and Hamm decided on a vigil. Hamm said initially, the vigil was going to focus on those harmed during the recent hurricanes and other natural disasters along with the shooting in Las Vegas.